A ray of hope for thousand of poor and toiling human. In the technology –driven world of Indians most populous city, one would have expected rickshaws to disappear with the faster growth of modern, motorized transport. Instead ,the number of rickshaw have increased amazingly in the last couple of year .In the absence of any substitute mode of transport for short distance ,the rickshaw meet the need for urban and sub-urban mobility in middle –and lower –middle income neighborhood; and provide a low-cost way to transport households goods and furniture. This has also the signifinces in the present day environment where we are talking about global warming and climate changes; and the cycle rickshaw becomes only the green mode of transportation by its very nature of avoiding carbon emission. It is estimated that there are 8 million rickshaw puller in India. However, hardly 10% rickshaw pullers own their rickshaw and the rest depend on the private owner on daily rental basis Rs.30 to Rs 50 vary from place to place. Neither have they had social security nor dignity at their work. The Richwak Bank of CRD has brought a hope to the rickshaw puller by providing a newly designed rickshaw, with insurances and license at an affordable cost with facilitating their solidarity for right and livelihood. 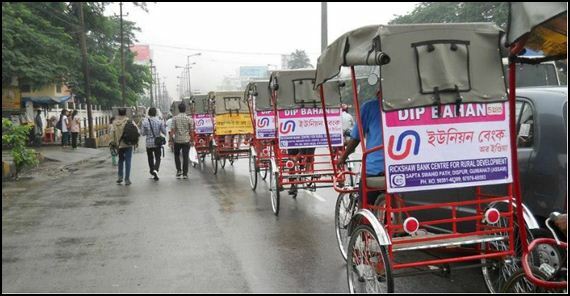 The pilot phase of the Rickshaw bank was launched in Guwahati and later it was expanded to the other areas in Assam and outside Assam too. The project was started with much hype on November 20,2004,and over the six year of period ,it has emerged itself as the flagship project of CRD.As on date CRD is the only organization in the world which has exclusively focusing on different development issues of the rickshaw puller and working continually with its rickshaw bank Project. Initially the project was started with the financial support of INDIAN oil Corporation (IOC), oil and Natural Gas Corporation (ONGC), Hindustan Lever Limited (HLL) and later on different bank and funding agencies extended their philanthropic assistances .During this financial year, Centre for rural development (CRD) pleased to have received financial assistances from Punjab National Bank (PNB), Union bank of India (UBI) and Milliped Foundation etc.